Kimi Räikkönen’s second race engineer Simon Rennie got excited during the SC-situation and reminded his driver to take care of the tire temperatures. 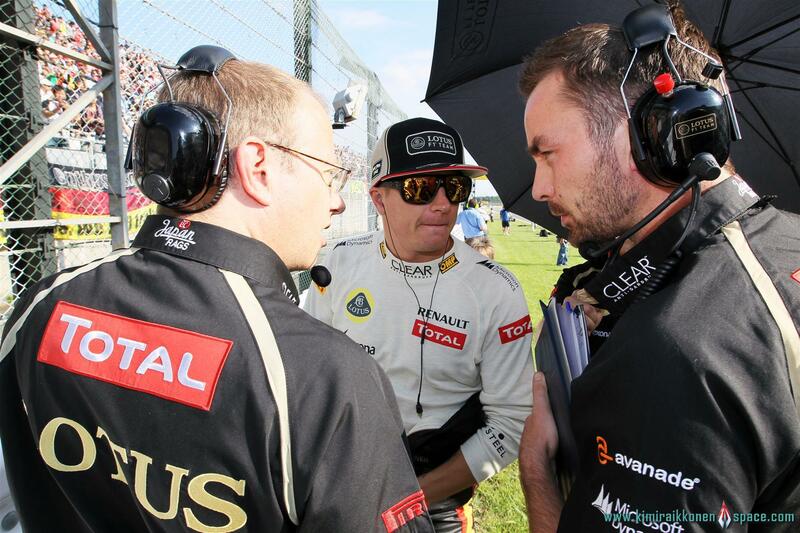 Räikkönen snapped in the radio that he is doing exactly that and asked him to leave him alone. His long-time and trusted race engineer Mark Slade said after the race, that he had adviced his colleague not to give instructions to Kimi, but he understood both parties. “We talked a lot to Kimi during the race. It’s completely okay when Kimi gets pissed off once in a while. It’s just his way of telling that he concentrates fully and knows what he is doing,” Slade justified to Turun Sanomat. Slade started alongside Räikkönen in 2002, stayed at McLaren when Kimi went to Ferrari and when the request came to become Kimi’s engineer in Lotus he immediately returned. “My best memories are from those races which have been most difficult to win. This is at the same level as Suzuka 2005. We have got victories like this with Kimi quite a lot – Spa 2004, Monaco 2005, Hungary 2005, there are many of them,” Slade listed. He himself had last won with Heikki Kovalainen in McLaren year 2008. How worried were the race engineers when the Safety Car situation ate away a big lead? “This time Kimi took perfectly care of it. He got the tires to work immediately in the re-start and the difference of half a second he made to Alonso during the two first laps was the construction box on which this victory was built upon,” Slade cleared. French magazine L’Equipe asked Slade if Räikkönen is better during his second F1-career than he was on his first one. “I think that Kimi is just the same. Two years haven’t changed him at all. And I don’t even believe that he left because he wanted to leave. Different circumstances brought him back and he is just as good as he was before,” Slade assured. Mika Häkkinen didn’t wonder over Kimi’s behavior during the important moments in Abu Dhabi GP. Räikkönen’s snarling at Lotus-team has been strongly covered in the media. He wasn’t satisfied when getting constant reminds about different things from the team in the middle of the race. Mika Häkkinen thinks that Kimi’s strong reaction was completely understandable. “It happened many times to me too that the team constantly repeats the same thing. F1 goes so fast that your concentration has to be 100 % in every corner, otherwise you lose control of the car. “I understand Kimi’s reaction fully. At some point it starts to bug you when they yap about the same thing all the time. “Kimi’s expression in those kind of situations is a bit different from many others, but you just have to accept it. I mean Lotus should already know at this point how to handle Kimi and how he works. “When the victory is close the team has enormous pressure. The team wants to ensure that the drivers understand the messages they get, but it’s really disturbing when the same thing is told over and over again about in every 5 corners,” Häkkinen says. Same here… I’m afraid to admit that I was getting worried for Kimi that he might get overtaken by Maldonado during the first safety car period and I was shouting at the tv for Kimi not sticking close enough to Hamilton, because Kimi’s poor restarts usually is the case, but when it mattered he stayed right behind him. Lol oops *blush* he put us all right. He is the only driver to have not retired from a race in 2012. Perhaps they forgot how kimi took care schumi at the peak of his F2004 during Belgian GP. After safety car, Kimi set strings of fastest laps and won in style. Next Has Kimi kept it cool?